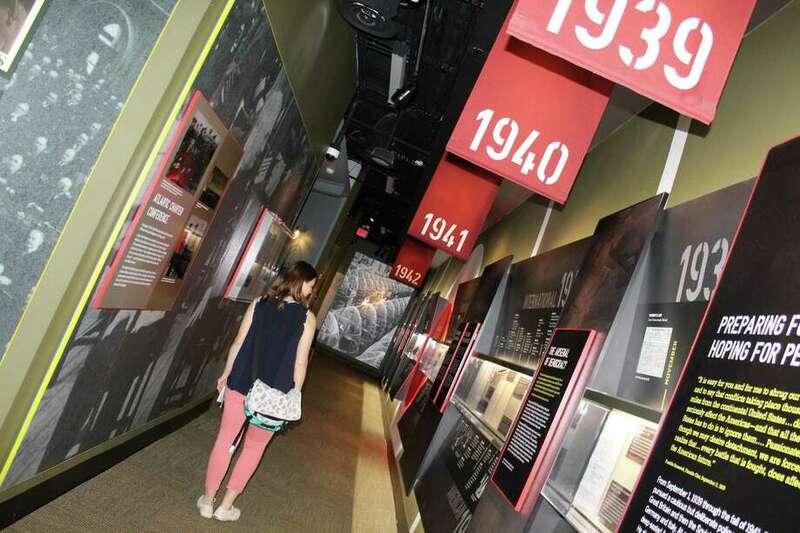 Reporter Sophie Vaughn observes a timeline of World War II at the Franklin D. Roosevelt Museum in Hyde Park, New York. HYDE PARK, N.Y. — “In many ways, we live in a world shaped by the Roosevelts,” the guide at the home of Franklin D. Roosevelt told my tour group. The longest-serving first family in history, President Franklin D. Roosevelt and his wife, Eleanor, sat at at the helm of United States and global politics for 12 years during one of the most critical periods in our nation’s history, from the Great Depression up until FDR’s death in April 1945, just a few months before the end of World War II. To better understand the Roosevelts and their impact on our world today, my colleague Pat Tomlinson and I took a day trip to Hyde Park, N.Y., where FDR grew up at a property called “Springwood,” and where he and Eleanor continued to keep residence, along with their children and FDR’s mother, Sara Delano Roosevelt, throughout his presidency. We began the day at Val-Kill, Eleanor Roosevelt’s home and the only National Historic Site dedicated to a first lady. Eleanor did not get along with Sara Delano and felt like a “house guest” at “Springwood,” and thus, seeking a place of her own, built a cottage a few miles away from Springwood near a running stream, or “kill” in Dutch. At Val-Kill, Eleanor and several of her friends created a small furniture factory to give struggling farmers a new skill to weather periods of economic hardship. The work-training programs at Val-Kill set a model for the larger-scale New Deal programs Roosevelt implemented as president during the Great Depression, our guide, Chris, said. After the factory shut-down, Eleanor converted the building into her personal home to replace her cottage residence. The guide led us through the small home to the pine-walled living room, where Eleanor sat at her desk and took refuge from constant travel to write her “My Day” newspaper column and visit with global leaders, such as John F. Kennedy, Winston Churchill and Chiang Kai-Shek, in her later years after FDR’s death. The house, which also included a small library, kitchen and dining room, is not extravagant, but neither was Eleanor, who cooked French toast and scrambled eggs for guests at the home when her cook was out. Eleanor intentionally did not hang a lot of artwork in the home, opting for pictures of friends and family, including pilot Amelia Earhart, our guide said. Following the tour, we were free to explore the surrounding gardens and trails, which our guide said are exceptionally beautiful in the fall. “This is just a special place. We could use more Eleanor Roosevelts today with all that’s going on. We need to be inspired and learn from history,” Rochester, N.Y., resident Kris Kremer, one of our fellow tour-goers, said. Home of Franklin D. Roosevelt and Presidential Library & Museum: 114 Estates Lane, Hyde Park;$20 joint admission ticket valid for two days. The Culinary Institute of America cooking school lies just a few miles from Val-Kill on the grounds of a former Jesuit seminary decked with grand Georgian architecture. “Hogwarts on the Hudson” is how the CIA’s communications manager, Jeff Levine, described the CIA’s property, where esteemed chefs, including Anthony Bourdain, attended school. The CIA houses three restaurants — one French, one Italian and one American, all staffed by student chefs and servers. We dined at American Bounty and were spoiled with a lunch of green salad with fresh strawberries, sauteed king salmon and strip loin and a dessert of vanilla bean angel food cake. For a quicker and more economical lunch, you may opt for the CIA’s Apple Pie Bakery, which, in addition to baked goods, has soups, salads and sandwiches that you can eat in the cafe or take to go. Alternatively, it is entirely possible, especially for food enthusiasts, to spend the entire day at the CIA taking an adult food class and dining over long meals at the CIA’s various eateries. Our next stop, again just a few miles away, was FDR’s home, presidential library and museum at Springwood. FDR established the library, the nation’s first presidential library, while he was still in office in order to house the thousands of documents and artifacts from his four-terms as president and make them accessible to the public. We visited FDR’s home in the afternoon because it is much larger and can accommodate large crowds, whereas Eleanor’s home is smaller and gets crowded in the afternoon, making the morning a more comfortable time to visit Val-Kill. FDR’s father, James, bought the 110-acre Springwood property with his first wife, Rebecca, as a country home in 1867. After Rebecca died and James remarried Sara Delano, they raised their only son, Franklin, at the home in a life of wealth and privilege before FDR left for boarding school at age 14. James died when FDR was a student at Harvard University, and Sara turned the home into a monument to the interests and accomplishments of her only child — from naval activities to birding and political victories. FDR returned to the home to live with Sara, his wife Eleanor, and their children. After FDR contracted polio, the home was never retrofitted to accommodate his illness and FDR had to pull himself up the stairs to reach his second-floor bedroom. Perhaps the most striking part of the 35-room home tour was the view of the Hudson Valley when you exit down the stairs from the second floor. Both FDR and Eleanor are buried in the rose garden outside the home, which is a beautiful place to wander before heading, if you still have the stamina, to the presidential museum just a few minutes’ walk away. The exhaustive museum traces FDR’s entire life and presidency and is a candy shop for FDR history buffs, who may want to block off a whole afternoon to visit. Indeed, we met several couples who spent a few days in the Hudson Valley to make time for a visit to the nearby Vanderbilt Mansion National Historic Site. The Hudson Valley is no longer the center of wealth and power it once was, but with the Roosevelt legacy intact, it is rich history.